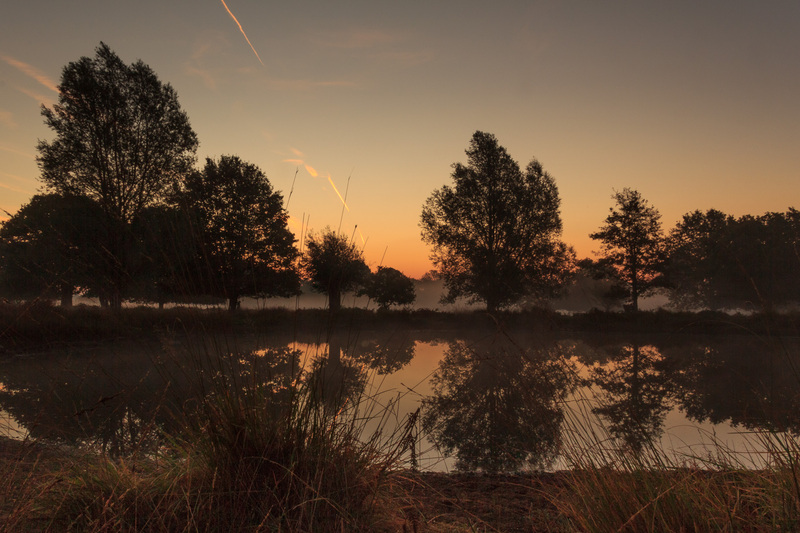 I was sat beside a small pond, with my camera set up on a tripod and nobody else around, hoping for an atmospheric scene to develop as the sun rose and it’s early rays burned through the light mist surrounding the nearby trees. I managed a couple of early shots, but the conditions weren’t quite as expected, with the light being harsh and contrasty and mist disappearing rather too quickly. 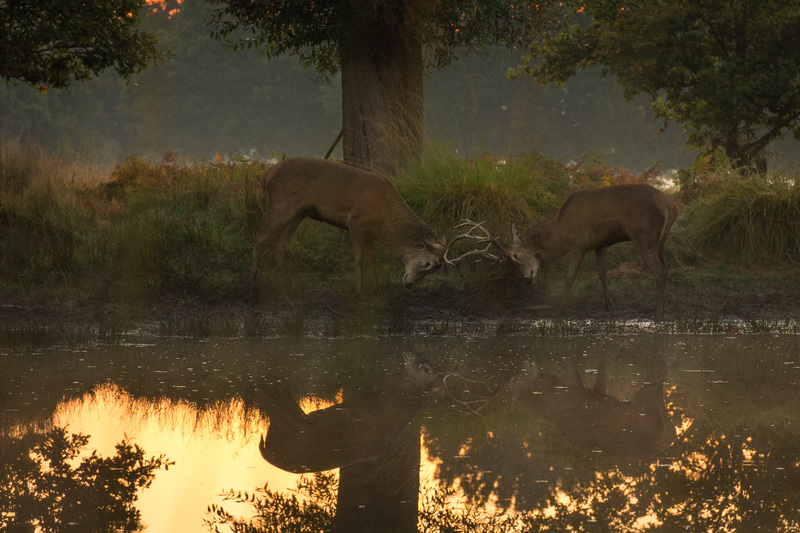 Just then a red deer stag walked into shot, between my position and the pond, no more than five metres away. Not knowing whether I should move away, from a safety perspective as they can be unpredictable, I decided to stay put, remain quiet and motionless and use my remote to keep firing the shutter button! The resulting shots weren’t very impressive, but I enjoyed the moment. He moved on after a couple of minutes, but was followed by more deer on the far side of the pond, so I captured a few more images – nothing astounding, mostly underexposed, but I was still enjoying it. 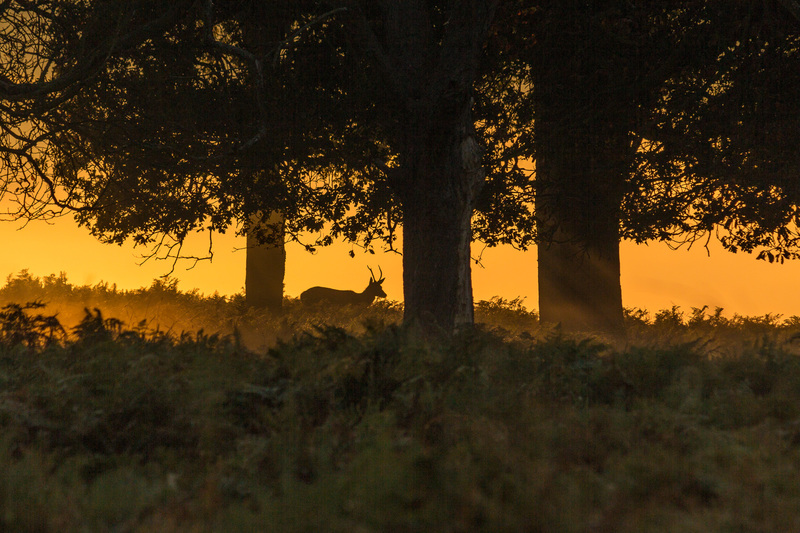 I should mention at this point, that until this day I had practically despised other photographers who followed the deer during the annual rut in Richmond Park. 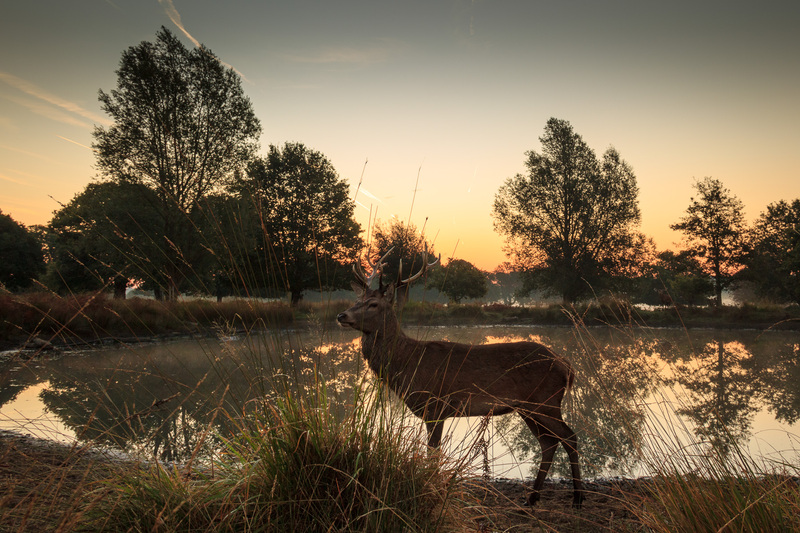 Being in the suburbs of London, it becomes very busy during autumn, drawing photographers from miles around with groups of them following the deer on all sides. It was scenes like the one below from 2009 that really put me off and made me want to avoid becoming involved. I think it speaks for itself! But let’s get back to the day in question. After the deer had moved on, I wasn’t keen to stay put as the aforementioned conditions weren’t turning out to be very photogenic. 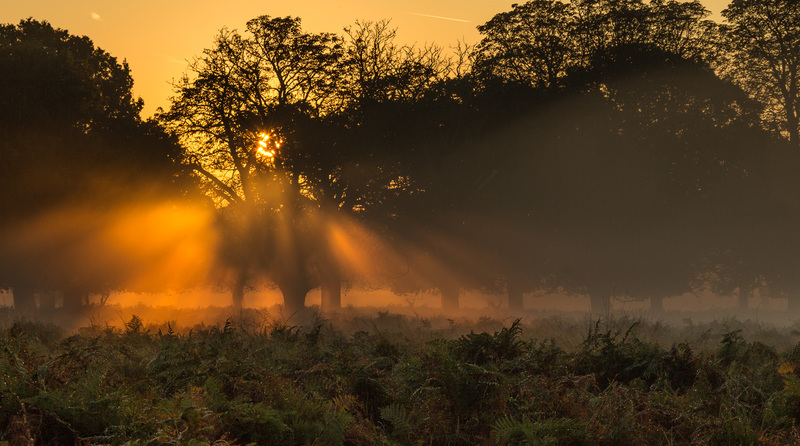 A few hundred metres away I could see wonderful light streaming through trees in mist, even though the mist near me had dissipated. So I picked up my gear and headed in that direction. 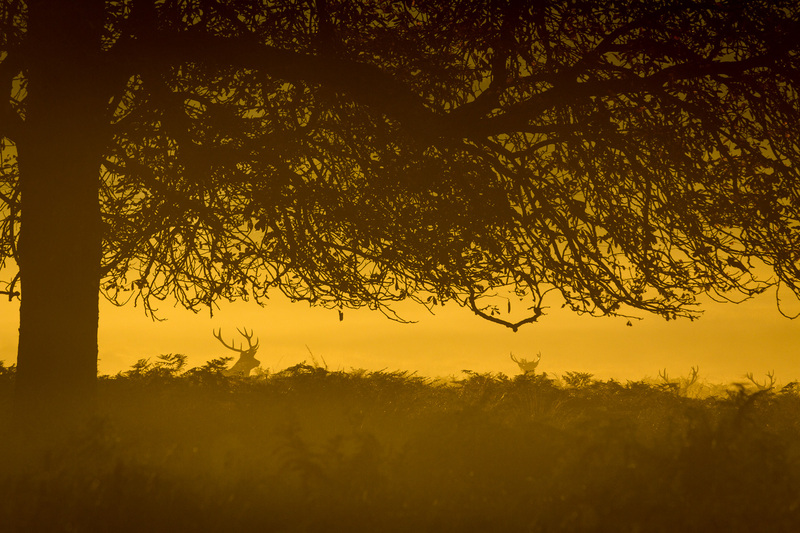 I managed a simple landscape silhouette of some trees, then noticed a couple of “deer hunters” away to my right pointing their long, white lenses into the trees. Movement in that direction caught my eye, and I spotted a few more deer making their way slowly through the woods, being backlit by the early morning sun. I made a few silhouette images, which was about all I could manage given the intense back lighting. Then came THE moment when the main image at the start of this article was made. 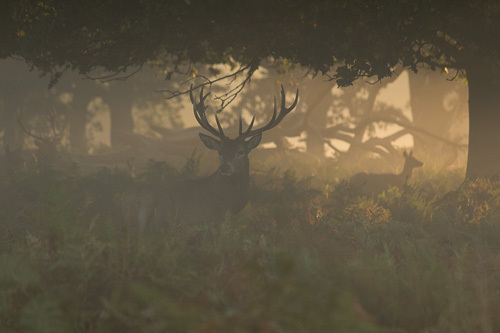 In a little copse of trees ahead, a stag with a small group of about four or five hinds was moving away from me. He stopped and looked back in my direction for about thirty seconds. 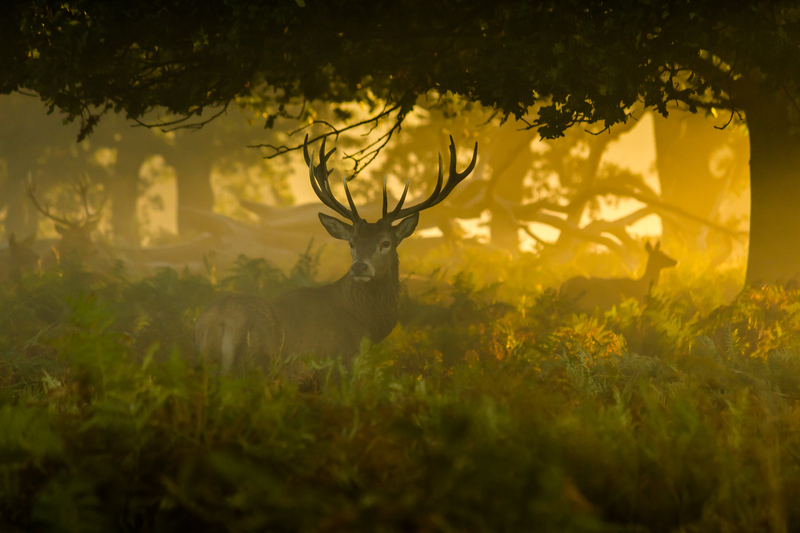 As we gazed at each other I fired the shutter, then he slowly resumed walking away, following his ladies. I left them to it, not wanting to interfere or cause them too much stress. THAT moment was IT – recorded at 07:49 on my camera. I felt somehow elated at capturing the scene before me and from there my interest grew. It’s by no means a perfect image – the contrast was extreme, the image is very noisy as I had to push the RAW file to recover detail. This is what it looked like straight from the camera. 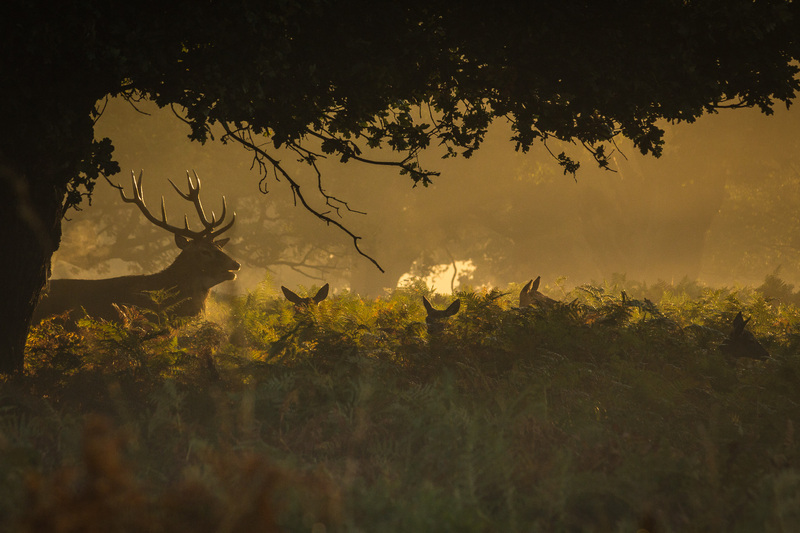 But I love the composition, the setting in the wood, the spread of the antlers, the eye contact, the outline of the hind and that light, it’s just sublime! I was definitely hooked from that one shot! 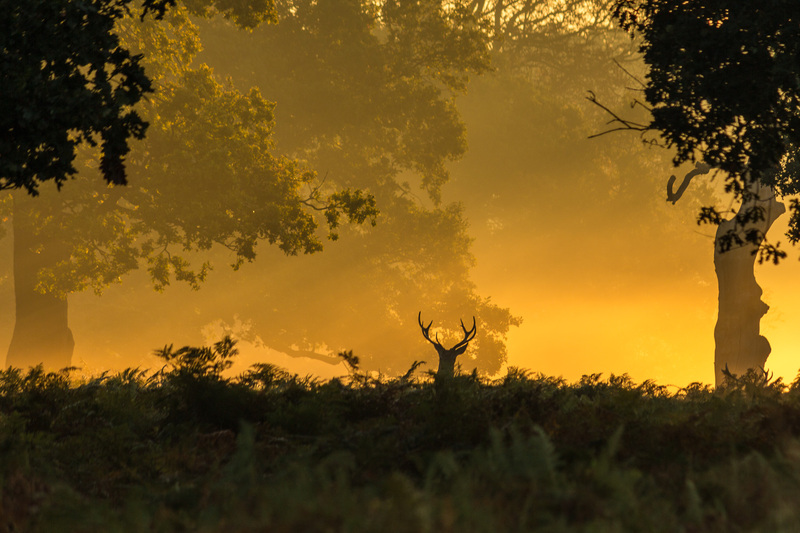 Since then I’ve attempted more deer photography, sometimes with success and sometimes not, but it’s always wonderful being out among the deer around sunrise, listening to them bellow even when you can’t see them through the mist! And if I see too many other photographers, then I walk the other way, trying to stay solitary and find the shot that nobody else will. 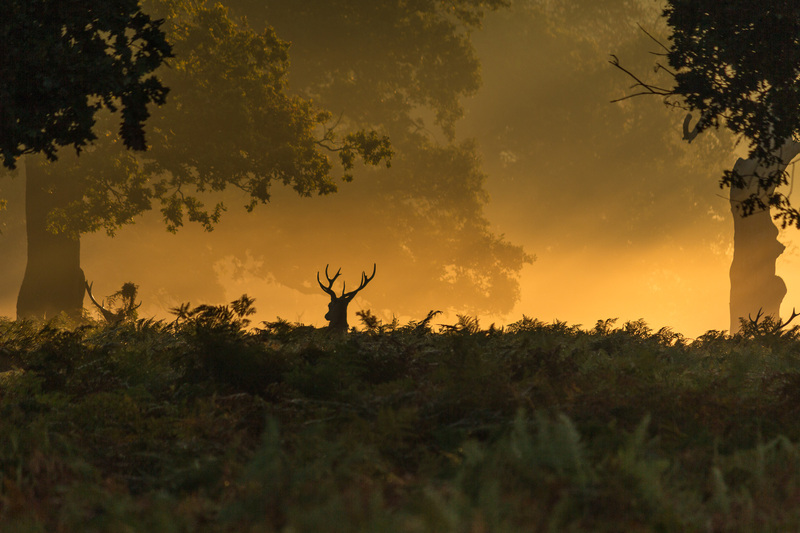 This entry was posted in landscape, Photography, wildlife and tagged autumn, Deer, nature, Photography, Richmond Park, rut, stag, wildlife by 47 Photography. Bookmark the permalink. A marvelous post and great photography. Thank you Victor, glad you like it. Love your photograhy – I try to be a wildlife photography, particularly macro shots of invertebrates – but I dont really have the equipment! your blog posts are very inspiring.